These sound like permissions/64-bit problems. You're on a 64-bit OS right? Week and half later.. still same problem. "Cannot check registry settings" error. It doesn't make sense that this is happening on all 3 of my Vista 64 bit computers. Worked fine on all 3 since ST 1. Now all of a sudden, all 3 machines.. same error. Anyone else running Vista 64 bit with all current updates and patches installed? 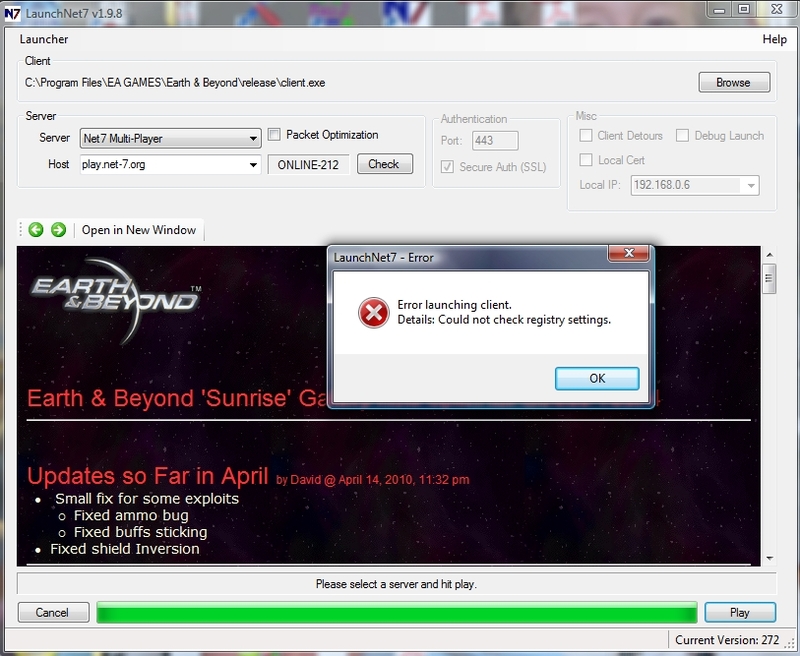 Run LaunchNet7 to check for updates. I've just put an update in that should allow you to continue to play the game even when there's a registry patching error. Woohoo!!!! It still complained after patch, but it did let me go through and play! Thanks for all your help. Good to hear. No problem. Update failed. Downloaded file is invalid. Hash of downloaded file and hash in server manifest does not match. File: c:\Program Files\EA GAMES\Earth & Beyond\Data\Client\ini\sounds.ini. Os is W7 32 bit. My W7 64 bit laptop does not have any problems. Any thoughts? Probably a corrupted download; I'm not sure why this would occur, but it means we need to add more redundancy to the updating system.